The effective and efficient management of critical incidents is vital to the safety and wellbeing of students, staff and the school community. It is particularly important to recognise and engage with those suffering trauma and distress as the result of a critical incident. Critical incidents may occur on or off school grounds and may involve one or more members of the school community. 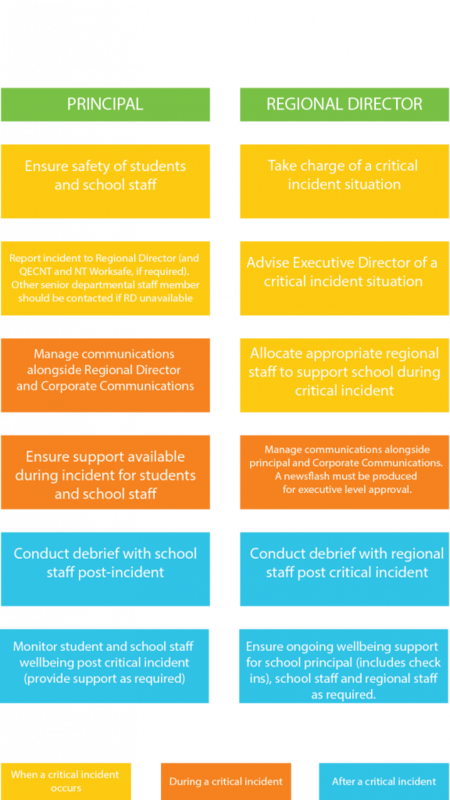 The Critical Incident Response Guidelines outlines managing a critical incident at the school, regional and departmental level. It is important for employees to manage their own wellbeing with regard to critical incidents. Employees may consider connecting with peers and managers as well as accessing counselling services through the NTG Employee Assistance Programs.